Raman spectroscopy is effective for the evaluation of carbon materials that have structures ranging from single crystals to amorphous films. It has a wide range of uses, from the evaluation of synthetic diamonds, graphite used for solar cells and crystallinity of carbon fibers, to the evaluation of Diamond-Like Carbon (DLC) films with an amorphous structure. It is also used in the evaluation of highly functional carbon materials, such as fullerenes like C60 materials and carbon nanotubes. 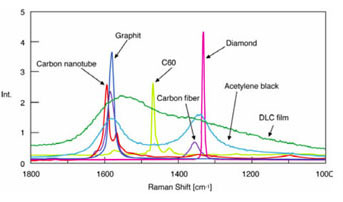 Figure illustrates the Raman spectra of various carbon materials. DLC films, widely employed as protective coatings, is also used for other applications, such as quality control, because its band shape has a good correlation with film properties, including wear resistance.